I first saw a titanium spork a long time ago. I was very young back then; I was in summer break, camping with some friends. My major was not set yet, and graduation day seemed long and distant. Although I wasn’t aware at the time, we were camping in titanium ore reach area of the Carpathians, and though the noble metal had not yet made its definitive mark on me, it had already began surrounding my existence with little tiny details. At least this is what I think now. My entire attention was focused on the beautiful landscapes we were roaming daily, and my entire vital energy was spent for climbing those nasty slopes, without losing my breath. It was vital, because my new lovely girlfriend was right beside me, and of course, there’s nothing more demeaning than a man who cannot take a little effort easily. Before you ask, no, she wasn’t wearing any piece of titanium jewelry. The loveliest moments of the day were began with the sunset, when we gathered around the campfire in front of our tents, we lit a fire, put the kettle on and bragged about the conquests of the day. The loving arms of the girl I tried to impress, the magnitude of the sky filled with stars, the mysterious sounds coming from the glade we were surrounded by are still the closest things to bliss that I ever met with. A couple that arrived some fey days later than the rest of us provided me with the first encounter with a titanium spork. It was the classic design, with the spoon and fork at the opposite ends, not the more modernist spork that I see daily now, and frankly, our main interest was about the ubiquity of the idea itself, and not the material it was made from. A strange device that was perfectly fit for the bunch of crazy kids that were gathered around that fire. Of course we all tried it. But we were not actual hard-core campers. I mean, our vans were practically near the tents. Our biggest problems were the car batteries running out, because we listened to too much music. We had no way of understanding the alpinist who asses it’s backpack to the gram, and who is glad of being able to replace two steel utensils with a titanium spork that weighs a quarter of the combined weight. Nor could we fully appreciate the corrosion resistance and low maintenance need of it. It was just something cool that we could use instead of a bottle for spinning. Later on, it was the main tool it for a precision throwing dart-like championship, our poor victims being some trees that were less fortunate positioned. Attached to a pole of wood, we also tried to spear some trout that populated the nearby stream we used for fresh water supply. We also entered the titanium spork for a wager with a shepherd that we met one day, chipping the poor sol soft-steel knife and gaining a loaf of fresh cheese in the process. After each and more endangering task we put that spork through, we were more and more astonished about how much stress can the poor thing take on. In the evening, gathered around the campfire we actually made brainstorming sessions to discover new ways of putting its qualities to test. 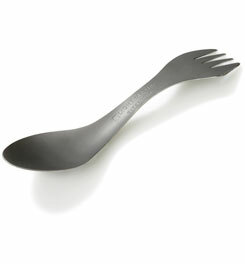 Those were the true titanium spork days. I don’t know if our imagination and youth could finally overcome titanium legendary endurance, toughness and strength, because, as always, all good things must come to an end, and we had to break camp and leave those mountains for the less sensational cities we lived in. I’ve never seen the owner of that titanium spork again, and frankly, I had almost forgotten about it. But you know, the life wheel spins in completely unpredictable ways, and titanium and I met again. I love this metal; I’m truly impressed every time I found new titanium applications, but never as much as the simple titanium spork succeeded in those youth days.